Per capita CO2 emissions in China reach European levels | Watts Up With That? Global emissions of carbon dioxide (CO2) – the main cause of global warming – increased by 3% last year, reaching an all-time high of 34 billion tonnes in 2011. In China, the world’s most populous country, average emissions of CO2 increased by 9% to 7.2 tonnes per capita. China is now within the range of 6 to 19 tonnes per capita emissions of the major industrialised countries. In the European Union, CO2 emissions dropped by 3% to 7.5 tonnes per capita. The United States remain one of the largest emitters of CO2, with 17.3 tones per capita, despite a decline due to the recession in 2008-2009, high oil prices and an increased share of natural gas. These are the main findings of the annual report ‘Trends in global CO2 emissions’, released today by the European Commission’s Joint Research Centre (JRC) and the Netherlands Environmental Assessment Agency (PBL). Based on recent results from the Emissions Database for Global Atmospheric Research (EDGAR) and latest statistics on energy use and relevant activities such as gas flaring and cement production, the report shows that global CO2 emissions continued to grow in 2011, despite reductions in OECD countries. Weak economic conditions, a mild winter, and energy savings stimulated by high oil prices led to a decrease of 3% in CO2 emissions in the European Union and of 2% in both the United States and Japan. Emissions from OECD countries now account for only one third of global CO2 emissions – the same share as that of China and India combined, where emissions increased by 9% and 6% respectively in 2011. 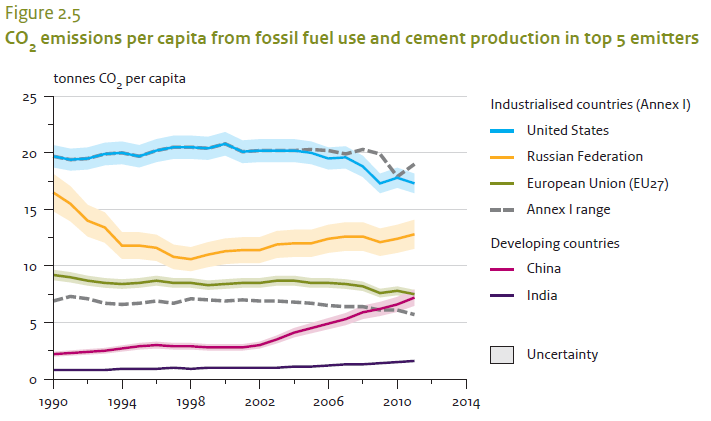 Economic growth in China led to significant increases in fossil fuel consumption driven by construction and infrastructure expansion. The growth in cement and steel production caused China’s domestic coal consumption to increase by 9.7%. The 3% increase in global CO2 emissions in 2011 is above the past decade’s average annual increase of 2.7%, with a decrease in 2008 and a surge of 5% in 2010. The top emitters contributing to the 34 billion tonnes of CO2 emitted globally in 2011 are: China (29%), the United States (16%), the European Union (11%), India (6%), the Russian Federation (5%) and Japan (4%). An estimated cumulative global total of 420 billion tonnes of CO2 were emitted between 2000 and 2011 due to human activities, including deforestation. Scientific literature suggests that limiting the rise in average global temperature to 2°C above pre-industrial levels – the target internationally adopted in UN climate negotiations – is possible only if cumulative CO2 emissions in the period 2000-2050 do not exceed 1 000 to 1 500 billion tonnes. If the current global trend of increasing CO2 emissions continues, cumulative emissions will surpass this limit within the next two decades. Fortunately, this trend is being mitigated by the expansion of renewable energy supplies, especially solar and wind energy and biofuels. The global share of these so-called modern renewables, which exclude hydropower, is growing at an accelerated speed and quadrupled from 1992 to 2011. This potentially represents about 0.8 billion tonnes of CO2 emissions avoided as a result of using renewable energy supplies in 2011, which is close to Germany’s total CO2 emissions in 2011. PBL is the Netherlands’ national institute for strategic policy analysis in the fields of environment, nature and spatial planning. It contributes to improving the quality of political and administrative decision making by conducting outlook studies, analyses and evaluations in which an integrated approach is considered paramount. Policy relevance is the prime concern in all PBL studies, for which independent and scientifically sound research is carried out on a solicited and unsolicited basis. As the Commission’s in-house science service, the Joint Research Centre’s mission is to provide EU policies with independent, evidence-based scientific and technical support throughout the whole policy cycle. Working in close cooperation with policy Directorates-General, the JRC addresses key societal challenges while stimulating innovation through developing new methods, tools and standards, and sharing its know-how with the Member States, the scientific community and international partners. Key policy areas include: environment and climate change; energy and transport; agriculture and food security; health and consumer protection; information society and digital agenda; safety and security, including nuclear; all supported through a cross-cutting and multidisciplinary approach. The Emissions Database for Global Atmospheric Research (EDGAR) uses the latest scientific information and data from international statistics on energy production and consumption, industrial manufacturing, agricultural production, waste treatment/disposal and the burning of biomass, in order to model emissions of greenhouse gases and air pollutants for all countries of the world in a comparable and consistent manner. EDGAR (version 4.2) is also unique in its provision of historical emissions data for 20 years prior to 1990, the reference year for the Kyoto protocol. Emissions are publicly available through the EDGAR website, hosted by the JRC. Unless you believe in little green fairies in the bottom of the garden of course. Such reports are always interesting to read, because they always speak about million and billions of tons of CO2. That sounds an awful lot to most people, since most people have no clue about the amount of CO2 in the atmosphere and the ration of it compared to all other gasses and components, let alone what a PPM is. It’s a classic misinformation, and of course the EUSSR is behind this. Not only hate they rising China and India but also all the people in Europe, not mention freedom and liberty. I wonder how long it’ll take for the unelected Eurocrats in Brussels (all the EU “commissioners” -the German term for them is, quite fittingly I must say, “commissars”- are appointed a close clique of power hungry neo-fascists, rather than elected by the people) to put people on trial for being skeptical of the IPCC version of the story. You can already get dragged into court in Europe for saying your opinion when it’s not politically correct and following what our so called leaders want you to think. Groan. One begged question after another. Assumptions chasing each others’ tails. Thinking only a bureaucrat could love. Can I get this straight? Which is it? 1. Global CO2 levels are still rising rapidly. The temperature graph is flat. Therefore the CO2 is not causing warming. 2. The use of shale oil has reduced the amount of CO2 being produced in the USA at least. This explains why the temp graph is “at” ( “at” for AGW purposes) Hansen’s and IPCC “best case” scenario. Lot of people sitting in offices collating inaccurate data, wasting time, money and effort in pretending they are doing something useful. Just noted in EU regulations that burning wastes eg in district heating boilers is exempt. European figures are fiddled. Not that it matters. It is a game of politics. On what basis are they making such an assertion? Computer models that start with that assumption. Ask people who post ‘flat’ temperature plots of 2002-2012 if they could please include error bars. Point out that if you plot the data since 2008 you can show steep warming. That’s more recent, so warming has started again, right? So which is it? Cooling, stasis, or warming? It’s a statistical crapshoot to look at four years of data, just as it is with ten years of data. The error bars for the regressions show this – but they’re apparently too inconvenient for some people’s narratives (‘global warming has stopped’). No – those temperature data, including from 2002-2012, are consistent with ongoing warming. Face it ladies and gentlemen–the plants are lovin’ it! So, who are the bureaucrats that hate all these life-giving, food-providing, shelter-contributing plants? Let them assemble for an honest eduction. Surely the 1st paragraph should commence with ” ….. (CO2) – the alleged main cause of global warming etc…. No – those temperature data, including from 2002-2012, are consistent with ongoing warming. I do not agree. Different data sets are different. But all show no or extremely little warming over the last 10 to 15 years. For details, see below. Roll on the cold snap. The only thing that’s going to knock this nonsense down is year after year of cold. 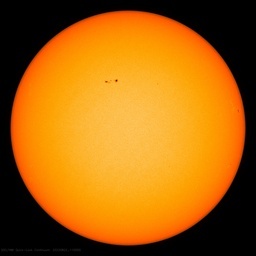 I’m sorry for it, but nothing else is going to kill this AGW rubbish, they just keep ploughing on, ignorning all facts and all reasoning, just screaming their message of doom. Facts and reasoning and real science will not reach all people out there (not unless the MSM WAKES UP), but the onset of cold years WILL. Bring it on, I say. I see these sort of data and I wonder, how do they measure that? I suspect it is a guesstimate. Scientists have discovered an “abrupt increase” since 1988 in the uptake of carbon dioxide (CO2) by the land biosphere, which comprises all of the planet’s plant and animal ecosystems. The findings do not contradict existing science about global warming, but rather explain how much CO2 is absorbed by plants and animals, with some of the CO2 then being passed from plants into the land. I find it odd the the US is singled out in this when China exceeds the US CO2 by a large margin and the US contribution of CO2 has DECREASED, while China, India, and the EU has INCREASED. You would think they would try to throw the US a bone, given that we have decreased our CO2 output. Who’s #1? Canada, probably? Crazy that the US isn’t first in per capita emissions anymore. Roll on the cold snap. The only thing that’s going to knock this nonsense down is year after year of cold. I’m sorry for it, but nothing else is going to kill this AGW rubbish, they just keep ploughing on, ignorning all facts and all reasoning, just screaming their message of doom…..
False. Looks like UHI is the main culprit, not *global* warming but in local urban warming where the thermometers have been placed as cities and airports have grown in recent decades and therefore get warmer over time, thus the warming trend, very locally but insignificant globally. The rest is mostly faulty warming biased homogeneous adjustments in the GHCN dataset… the mother of most climate surface temperature datasets and algorithms. I wonder what the per capita rate of decrease of CO2 production is in the US and China. Given that we are ahead of the curve on CO2 decline what the hell is the beef, and what the hell is the point in creating data that includes nose counts? Does anyone really believe there is useful correlation between the population of China and the population of the US? So, it is ultimately about redistribution of wealth and CO2 in the end ? Get out you wallet, or VOTE! The only “scientific [sic] literature” claiming this nonsense is that in Nature in 2009, to which I submitted a Brief Communication on 15th June 2009, pointing out that its issue of 30 April 2009, with no fewer than nine articles claiming that it is not the [net] atmospheric concentration of carbon dioxide (i.e. [CO2]) that is responsible for rising global mean temperature (GMT), as asserted by the IPCC, but the total cumulative volume of GROSS anthropogenic emissions of CO2. I pointed out that this approach implied there are and have been no uptakes of CO2 by the global biospheres, both oceanic and terrestrial. My rejection note from Nature’s Michael White stated the articles had “implicitly” taken such absorptions into account. In a second Brief Communication I responded as follows showing this not to be the case, but with the same result, rejection by Dr White (8th July 2009). Nature’s leading article “Time to Act” (30 April 2009)8 supports the claim in Meinshausen et al. and the other 8 articles in that issue that it is total cumulative or annual emissions which determine climate change, not the atmospheric concentration that emerges after taking into account net uptakes of carbon: “The 500 billion tonnes of carbon that humans have added to the atmosphere lie heavily on the world, and the burden swells by at least 9 billion tonnes a year (sic)” (p.1077), even though the actual increase in the atmospheric concentration of CO2 (i.e. [CO2]) recorded at Mauna Loa between May 2008 and May 2009 was only 1.68 parts per million by volume (ppm), equivalent to 3.56 billion tonnes of carbon (GtC), while the total increase in the atmospheric concentration since the pre-industrial era is only from 280 ppm to 390 ppm (May 2009). That 110 ppm equates to 233.2 GtC, somewhat less than the 500 GtC from which Nature’s editor White claims its articles had already “implicitly” subtracted the “net carbon uptakes”. So “implicit” accounting for net carbon uptakes apparently raises what was the actual net increase in CO2 at Mauna Loa from 3.56 GtC from May 2008 to April 2009 to Nature’s “at least 9 GtC a year”. The real cause for concern however is the emission reduction policies of the EU, Australia and the USA et al. based on Nature’s junk science aiming for emissions to be reduced by at least by 88% from the 2005 level by 2050. If implemented globally, this implies that by 2050 global emissions (mainly from burning fossil fuels) will be reduced to 1.16 GtC (including reductions in land use change), far below the global biospheric net uptakes of CO2, at 4.3 GtC in 2005, an El Niño year, and 6 GtC in 2006 (La Niña). globe, a demonstrably more equitable and cost-effective solution than the geo-engineering solutions, like creating stratospheric sunshades, that Nature’s articles and editorial of April 30, 2009 favoured. Why are Nature, its authors, and the EU opposed to increasing world food supply? PS My full account of my exchanges with Nature is in Energy & Environment • Vol. 20, No. 7, 2009, available at my website http://www.timcurtin.com. It seems more like global warming stopped at the end of last century and Earth started cooling from around 2001. The linear trend since 2001 is now near -0.8°C (-1.44°F) per century. CO2 concentration in the atmosphere may, or may not, keep on rising at Mauna Loa. Enough said. How about dem Yankees? Does anyone have the total CO2 numbers for this time period? Both natural and man made. It would be nice to know. We used to account for 4-5% of the CO2 (~6 gigatons out of 180-200). I would like to know are we now 34 out of 214? 234? After all it is the total amount that we should all be scared of (nudge, nudge, wink, wink, know what I mean?). “I don’t see the current low prices as affecting the longevity of the CDM,” Maosheng Duan, the executive board chairman of the CDM, said in an emailed statement. But the crash in prices has been hard on many project developers, particularly those that have contracted to buy carbon credits at prices much higher than current levels. “This downward movement is extremely negative for project developers,” said Gus Hochschild, alternative energy equity analyst at Mirabaud Securities, adding low prices could cause the liabilities of some companies to outstrip their cash positions. Prices for CERs often follow movements in EU permits called EU allowances (EUAs) and both markets are over-supplied, which has dragged prices to record low levels. “It is certainly not the death of the market and we expect CERs to carry on trading even if we won’t see the heady prices of 13 euros again,” a carbon trader said. “I can understand panic when a lot of companies’ portfolios are five euros under water but the EU and U.N. have the ability to limit supply and decide which credits are eligible and where. It’s not all doom and gloom,” he added. Only Western capitalist pigs need to suffer the consequence of excess CO2. All problems are caused by the West, and then if there is a tie, by Bush. Of the larger economies, Australia is the biggest per capita CO2 emitter, because we don’t have nuclear and very little hydro. Canada is the biggest per capita energy consumer, but they have nuclear and lots of hydro. In Washington State hydro is no longer considered a renewable energy source. I guess the thinking is global warming is going to eliminate all our rain. Or magic happens. What ever, on the I-90 corridor in the Kittitas plateau above the mighty Columbia river, hundreds of feet above sea level, there is a huge new cluster of wind farms that are slowing dying, as they all do. In 20 years the Columbia will still be rolling along and these windmills will be rusted hulks. Proving that wind power is renewable – necessarily often. 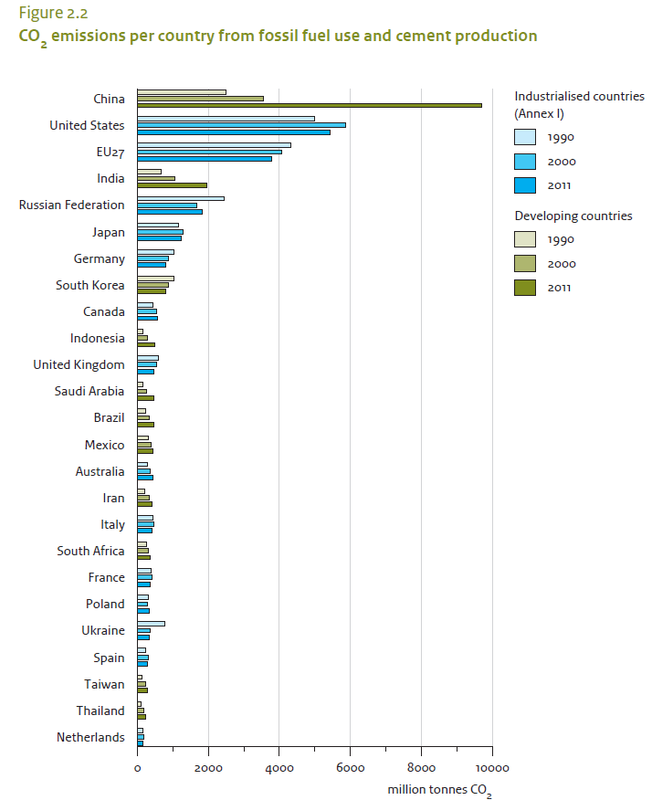 Emissions in the Industrial countries flat since 1990. All growth has been in the developing countries – and all evidence indicates that’s going to continue. Yeah and New Zealand CO2 emissions didn’t rank on that list at at mere 0.2% of Global emissions. Yet we’ve been strangled with an ETS while some loonie local authorities along with the Green lobby are trying to reduce our emissions further by upto 40% by 2020. So we sacrifice our economy for zip, nada, zero improvement on Global Emissions while China and India steam ahead with theirs. I have a question. If the human emission of CO2 is only a small part (3%?) of the natural emission, why does the global amount of CO2 continue to increase? If the plants can absorb 97% of the CO2, why cant’ they absorb 100%? Maybe I am missing something? Jan Meeus: It’s an inventory situation. There’s a large stock of CO2 in the atmosphere, about 830 GtC, of which about 12% p.a. is continuously being recycled down from the atmosphere and back up again from the planet’s land and sea, while every year there are emissions of 9-10 GtC of which on average only 56% is added to the opening stock of 830 GtC – but then joins the annual fluxes up and down. CO2 is however fungible, like money, so we never know which particular molecules are in the 12% flux this year or will be in 2013. The IPCC’s TAR (Houghton et al 2001) and Houghton’s own book (2004) give clear accounts of the process I have just described, but it is mostly absent from the Nobel prize winners’ tosh in IPCC AR4 2007. Now where did the EC “inhouse science service” get that little gem of misinformation from ? So the addition of these graphs should look the same as the rise in CO2? You can’t simply fish for the longest period in the data for a flat trend line. After all, what’s to stop me simply fishing for a steeply positive trend over more recent temperature data and using that as an argument that perhaps warming had stopped, but that it’s restarted faster than ever? No – we must not look at the slope of regression lines in isolation. We need to apply some statistics to try to identify whether you’re looking at a genuine warming signal – or lack of one – or simply interannual variation. And that variation is large, especially in satellite data. We expect to see ~decade-long periods of flat lines with simple linear regressions. You can prove this to yourself by creating synthetic data of constant global warming with noise superimposed on top. Lo and behold – you get ‘flat’ periods, but we know the global warming signal is still there. After all, we created the data! Look at the error bars on all those slopes: all of them include 0 °C/decade warming, but all of them also include the expected warming trend of 0.017 °C/decade. They also don’t exclude acclerating warming, over 0.14 °C/decade. No – it’s simply not fair to say that these data show global warming has stopped or slowed.Tempting though it might be, you cannot wish away those error bars that show ongoing warming is perfectly consistent within those data periods. So how long do we need to establish statistical significance in any global temperature data? Tamino has shown that in NASA GISS 15 years of data gives us a 50/50 chance of detecting a 0.017C/decade trend. Looking at shorter periods is simple folly. It amuses me that CO2 production is always given as a mass of CO2 as if this was important. What is important, IF the GHG theory is correct, is the proportion that human output is of the total annual budget. This continues to be at around 4% of the total so not of real significance. The alarmists should stop volcanic activity to do a real job on this problem(?)sarc. off. Sounds really good – but its wrong. Read http://wattsupwiththat.com/2012/07/18/researchers-publish-results-of-iron-ocean-fertilization-experiment/ about the diatoms in the sea – possibly the largest biomass in the world – as they die and sink taking carbon down with them – continually. Its where all those limestone rocks come from trccurtin. You did realize that those rocks are all diatom shells didn’t you? The diatoms took huge amounts of CO2 out of the early atmosphere to the detriment of plants. All these nice IPCC calculations based on false assumptions. Of course thanks to Henry’s law once the oceans start cooling the gassing off of CO2 will stop and more will dissolve and then Mauna Loa will cease its monotonic rise that is so unrepresentative of the rises and falls in the economies and the increases and decreases of burning of fossil fuels – but then spotting a half of one percent change in atmospheric CO2 is difficult. The ‘carbon’ markets are just another way of taking money from the gullible who have been told to believe that warmer and more food is bad, and that colder with less food is good. The rate of warming out of the Little Ice Age has continued with some ups and downs. But we are at the coldest part of the Holocene. From the evidence so far extra CO2 in the atmosphere has done nothing but good. If you disagree show observational evidence to the contrary – not models real tangible evidence. With the numbers of people dying of hunger already the last thing we need is a cold period even at the level of the 1970s. As you eloquently point out, trying to tease out a proof of AGW based on the temperature record is wishful thinking at its worst. There is no way you can argue that temperatures have done what James Hanson and the IPCC have predicted. Global emissions of carbon dioxide (CO2) – the main cause of global warming..
Yeah, as if you can believe anything that emerges from the EU, especially data!!!!! Now, if you go into any town/village hall, & encounter 100 people, & you ask them if faries do exist & live there, & 95 people vote yes, & the remaining 5 people say they’re not sure or no they don’t believe in faries, you have just proven by AGW logic by 95:5 that faries actually do exist & do live at the bottom of the garden! Simple science! I wonder why China and India are still labelled “developing”. They are so industrialised now that they should be joining the “developed” world. And plants world wide, continue to celebrate. The Mauna Loa measurement shows from 2010-2011 an increase from 389.78ppm to 391.57ppm and this is not equal to the increased by 3% last year. We should see about 401.47ppm. Where did the ~10ppm go? In other words, from the 3% of CO2 produced only about 0.46% were added to the atmosphere. Silly question: Did the plants destroyed it? If yes, then just plant more trees. Actually, there was recently two thins published that the world got colder because of Christopher Columbus and Dschinghis Khan that caused cooling because trees too over farm land. Proof it! Makes China and India not so stupid after all to simply walk ahead without listening to much to beliefs brought forward by arrogant scientists/politicians. Its worth not a single life to not develop to achieve worthless CO2 targets. Germany’s complete emissions, if all that was true and would matter, was the increase from 1990 to 2000. If not for the scientific argument, the number should be a wake up call for Brussels, Berlin and Washington. Anybody there – need not to be too brainy. Anytime anything in China (or India) reaches a level PER CAPITA, it is a lot –> there are a heck of a lot of Chinese. That is why I intentionally did not look at anything under 10 years. Note that three of the data sets had no warming over 15 years. With the error bars that you have shown such as 0.0 C +/- 0.2 C/decade, extra warming is just as likely as extra cooling so that proves little. By not mentioning error bars, I am just keeping up with Jones and if he says there has been no global warming for 15 years, that is good enough for me. Unfortunately, every argument you make also argues against your own position. I’ve hopefully been careful enough to say the data are consistent with ongoing warming. They’re also consistent with cooling, with temperature stasis – i.e. by ignoring error bars we can frankly claim anything by carefully selecting the period we analyse. Refusing to look beyond a window of ~10 years means you’re doomed to not reliably find any warming if it’s there. It’s not very useful. I should add that this is an easy trap to fall into, but also easy to climb out of with a little thought. trying to tease out a proof of AGW based on the temperature record is wishful thinking at its worst. I agree, it’d be foolish to look at AGW from a solely statistical perspective, fortunately we have a lot of physics too! By not mentioning error bars, I am just keeping up with Jones and if he says there has been no global warming for 15 years, that is good enough for me. I hope you see now how the quesiton posed to Prof Jones was quite loaded. It’s not something you can answer in a soundbite. The failure to reach statistical significance with 15 years’ data does not mean there was no global warming. As I mentioned upthread, the chances of detecting warming over even 15 years is only ~50/50. Not good odds. Had warming been significant, I’m pretty sure the interviewer would have asked ‘what about warming over the last 14 years?’ instead. Jones wasn’t ruling out warming, and since that interview the warming did become statistically significant. It just took more data for the trend to emerge from noise, as we’d expect. When smoothing the data shows obvious changes in slope, then it can be of interest to examine linear trends within those slope domains of the data. Year to year and month to month variations due to oscillations such as ENSO obscure longer term trends that smoothing will highlight, and which can be examined without fear of arbitrariness or ‘cherry picking’. shows rising temperatures between about 1975 or so and about 2000. And the smoothed line is even responsive enough to show the effects of the eruptions of El Chichon (early 80s) and Pinatubo (early 90s). The current slump in warming is longer than either of those two and has been proceeding without the help of any major vulcanism, and in the face of unabated increases in CO2 concentrations. Other major datasets show similar features, despite slight differences in methodology. Something important, at least as important as CO2, is obviously going on here. While Svensmark and Kirkby might not yet have enough experimental data to demonstrate unequivocally a strong solar role, theirs is the leading alternative hypothesis at present. Indeed, you mentioned ‘consistent with’ in your very first post at 5:50. But this is one part Sophist equivocation and one part the Sophist Sorties paradox. For certainly if you agree with physics then you agree that the temperature of the universe as a whole is consistent with ongoing cooling, but not ongoing warming. But the question is not whether there is ongoing warming or cooling with in some constrained notion of time or space. It is a question of whether the data is consistent with any given theory. Specifically with reference, in this instance, to causality within that theory. Which is a simple idea, you can either make correct predictions with that theory or not. But the record over the last ten years is consistent with any scenario of temperature change. So any theory that stated we would see a definite temperature change over the last 10 years is strictly falsified. If you disagree with this then certainly you accept that my theory of a global ice age is perfectly correct since I incorrectly predicted that Lake Erie would be covered with glaciers by now. Of course CO2 is the causal agent in my theory and so we had better curb CO2 production — right now, before we’re all doomed — because otherwise Lake Erie will have been covered in glaciers already. Obviously the entire notion is absurd, but that has been precisely the case with every theory of global warming, encoded as a formal logic in a computer model, that has predicted a definite warming signal over the last 10 years. But that presumes there is a theory at all. For there any many inconsistent models of climate prediction that exist on various geographic and temporal scales that utilize CO2 as a causal agent. And it is certainly the case that numerous of these have falsified themselves by claiming that reality is not what reality is. And yet these same models are in current usage as ‘valid’ and ‘consistent’ so long as we average them all together and fail to make valid predictions. Though if they had included my model of CO2 caused global ice ages then the average of the models would not be at odds with measurements at all. And CO2 would still be the causal object. The point being that if there are numerous falsified theories of global warming then the adherence to CO2 as causal for all of them and that all of them are correct in aggregate is to state that global warming is a metaphysical commitment to CO2 and that there is, as yet, no theory of global warming. But if that’s the case then every theory of Theism is correct, even when they are obviously wrong, and so we should obviously take political steps to keep Atheism at bay. Lest calamity ensue. This too is absurd. But far from doing foul things with Karl Popper’s corpse it is simply Jonestown Koolaid Kult nonsense. And this is not difficult. For if we commit to the metaphysical principle of CO2 being causal then the flat-ish temperatures in the face of increasing CO2 disprove this metaphysical commitment. That is, CO2 can simply not be causal unless you invent new physics to ‘make’ the metaphysical commitment true. Of course, if you state that the error bars for the measured increase in CO2 is within the error bars for your particular theory of CO2 as a causal model then that’s perfectly fine. But if that is the case then we can neither state that the current relation between temperature and CO2 is consistent *or* inconsistent. It is simply not testable. Which is only to say that global warming is either not science or is not science yet. For we can hardly prove that CO2 is a causal factor unless a measurable change in CO2 is correlated in such a manner that it can be unequivocably said that it is causal to a measurable change in temperature. Of course this has yet to occur. And certainly you can defend the notion that we ought give credibility, and funding, to research that chases this metaphysical commitment on the basis that, even if gobsmackingly wrong, the models allow us to make useful predictions about regional temperatures. But that is to only deny that we can derive any knowledge from CO2 itself. But even then, to the degree that such an argument is valid — and has been for such things as Newtonian mechanics — then it cannot be said that the commitment to CO2 makes useful predictions at differing scales either. For CO2 based models have error bars twice as large as a random walk when predicting regional effects. And in this case it is not simply an issue of falsified theories. It is a matter of being wrong *on purpose*. For if there were any potential for useful predictions then they would be no worse than random chance. If you continue to hold and assert that these are not dispositive issues then certainly you agree that my theory that Lake Erie is currently under a glacier is correct because Lake Erie is currently not under a glacier. And that it is then proven by physics that CO2 is responsible for the ice age that will occur even though it hasn’t occurred. But since you agree you could be a pal and help convince the government to toss research funding my way. For we have desperate need to study how to avoid the ice age that didn’t happen. Also my food bill isn’t cheap. Of course China’s output is partially (or mostly) the result of producing goods for everyone else. A word to the wise : never use colors in a graph to exhibit information : upwards of 10% of the male population is color blind. More extremly accurate nonsense. Worldwide and North American reported CO2 emissions by Man are depicited here. Bu tMan is a tieny contributor to atmospheric CO2. Butnow here is the est of the story. Mankinds emissions are around 3% of the total CO2 emissions. The other 97% is produced by Nature. Some areas such as the Western hemisphere continents do a much better job absorbing and sequestering CO2 emissions. In North America there issi an extremley efficient set of CO2 biosequestration effects,set in place by both Man and Nature. The continent is comparatively very unpopulated and there are lots of farmland, ranchland and productive woodlands to absorb CO2. In North America much of thre forests arre managed and then hrvested for lumber and paper and then replanted. So there is always young growing trees which absorb lots of CO2. Ditto for the farmlands. Growing plants absorb lots of CO2. Other lands unsuitable to farming or silviculture are use for ranchlands and grazing animals crop the grasses and stimulate regrowth. As a result scientific studies reveal that ALL the CO2 produced in North America is sequestered there annually, and the some more besides. Scientists working at Princeton monitored the Air with its CO2 blowing in from the Pacific on prevailing winds and measured it CO2 content as is moved across the country toward the Atlantic. They proved that North America is a Net CARBON SINK, absorbing all its CO2 flux, produced by Man or Nature. South Americais also a Net CARBON SINK but for a different reason. It has the largest un-managed rain forest in the World, sufficient to sequester all the CO2 produced there by Man or Nature. The margin is not as large as in North America because Amazonia is largely a repalcement un-managed rain forest. So it is not composed of rapidly growing young replacement trees. It is composed of mostly mature growth so-called “old growth” as consumes little new CO2, but Amazonia is so large that it more than suffices. Even if CO2 were a problem, which I do not scientifically concede any longer, the Western Hemisphere and its peopless have no work to do, as it is finished. Eurasia and Africa may still have some work to do with CO2 if you beleive that it is a problem, as these continents are net CARBON SOURCES. I hope you see now how the question posed to Prof Jones was quite loaded. You are talking about the quote from Feb. 13, 2010 when he said the warming was 0.12 C/decade but that this was not significant at the 95% level. I agree this was loaded. But the later quote that I referred to two years later was a simple statement of fact where the warming was indeed 0 over 15 years, ignoring error bars. So any theory that stated we would see a definite temperature change over the last 10 years is strictly falsified. For the sake of the argument assuming that is true, is there a theory that stated such a thing? What theory would that be proposed where and by whom? And this is not difficult. For if we commit to the metaphysical principle of CO2 being causal then the flat-ish temperatures in the face of increasing CO2 disprove this metaphysical commitment. 1. The causal relationship between CO2 and temperature is not “metaphysical”. It’s based on tested theory in physics. 2. Your claim about the “flat-ish” temperatures over a 10-year interval falsify the causal relationship is nonsense. No one claims a linear relationship between CO2 and measured temperature, or that CO2 was the only factor causing temperature variability or that is was the dominant factor of the temperature variability on all time scales. The theory that is allegedly falsified is only a figment of your imagination, but not what is said by mainstream climate science. I don’t quite understand what your argument is and what you are trying to prove with your graphs about the temperature trend for the last 15 years and shorter. So what if it doesn’t take 15 years, but 17 years or 20 years until the global warming trend becomes statististically significant with 95% probability. Is the conclusion from this supposed to be that there wan’t any global warming trend? Or what if the trend isn’t statistically significant with 95% probability yet, but it is with 90% probability. Is the conclusion from this supposed to be that there wasn’t any global warming trend? How is it going to be in 50, 100 or 200 years from now? If the globally averaged temperature anomaly has continued to rise over the decades and centuries, are you still going to point to the then most recent 15 years that there wasn’t any global warming over such a time scale and shorter? You still will find such periods also in the future, despite the long-term warming trend, because on such short time-scales the variability of the global temperature anomaly is dominated by natural factors, like ENSO or the 11-year solar cycle. Perlwitz: SkS is a totally unreliable source. Just check out Grigg and Harries, possibly the most prolific analysts of outgoing longwave radiation. Their 2007 JoC paper Comparison of Spectrally Resolved Outgoing Longwave Radiation over the Tropical Pacific between 1970 and 2003 Using IRIS, IMG, and AIRS, in the actual data in their Tables A1 and A5 show temperatures by altitude in 1970 and 2003, with absolutely ZERO change, the trends and levels are BOTH identical and indistinguishable using Excel (which is beyond them in their actual text, with their snouts in the grants pudding). I am sure you are aware of the ‘travesty’ comment by Trenberth. My interpretation is that privately, they were shocked to see a period of 10 years with no warming. But when that actually happened. they said it appeared in 1 out of 8 model runs. Fair enough. I will accept that. However I also read that no model runs showed 15 years of no warming. Now that three of the data sets show over 15 years of no warming, Santer says we need 17 years for something or other. I am not sure if he is implying that 17 years of no warming means that CAGW is false. But if that happened, I would not be surprised if the goal posts get shifted again. So what am I trying to prove? We are beyond Trenberth’s ‘travesty’ in terms of time of no warming and are rapidly approaching Santer’s 17 years. With 15 years and 7 months on RSS, we are 92% of the way there. Is the conclusion from this supposed to be that there wasn’t any global warming trend? If we did get to 17 years of no warming, I would NOT say that there wasn’t any global warming trend, but I WOULD say the warming is NOT at catastrophic rates, implying there is nothing we need to do about it. By looking at the global warming trend within the long term parameters within which the rise in global warming is occurring, we see that there has been no recent acceleration of the warming trend. Since temperatures have not broken out above their long term parameters, the only logical conclusion is that the effect of CO2 on temperature is simply too small to measure. The long term trend remains unchanged. The rise in temperature since the LIA is not accelerating. The effect may exist, but it is insignificant. Therefore, any minuscule effect from CO2 can be disregarded for all practical purposes. The gradually declining long term trend line [the green line] shows that temperatures are not accelerating. The rise in global temperatures has not deviated from its long term trend line since the end of the LIA, when CO2 was at ≈280 ppmv. CO2 is now at ≈392 ppmv. But that ≈40% rise in CO2 has not caused an acceleration of the gradual warming trend. Thus the rise in CO2 is likely an effect of warming, not the cause. Finally, there is far too much misuse of the term “theory” when discussing what is simply an evidence-free conjecture. CO2=CAGW is only a baseless conjecture, with no empirical, testable supporting evidence. It is not, and never was, a “theory”. You, like, totally don’t got no clue about the significance of 90 and 95% significance. It means the circumstances in question could happen by chance once in 10 or 20 times. Regardless of how low your personal scientific (or non-scientific “climatological”) standards are, those are NOT adequate odds on which to base drastic economic decisions virtually certain to inflict global penury. I think this is an example the false perception of the role of CO2. I believe it has been documented that that most of the ‘Greenhouse Effect’ warming is due to water vapor in the atmosphere.